I do a lot of my fabric selection and shopping online, and that can present a challenge on occasion. Lately, I have been really drawn to creating quilts with subtle tonal differences like in my Triangle Transparency quilt. The key to getting a design like Triangle Transparency to pop is in the fabric selection, and I wanted to share some of my thoughts on evaluating fabric color value. Then I took the image and converted it to greyscale. Several things immediately jump out to me when I change it to greyscale. In the fabric on the left (what I had sorted as the lightest value fabric), the print has an uneven mix of color value. There are areas within the same print that read as much lighter than other areas. The same thing is true for the print on the far right. Evaluating the print on the right in closer detail, let’s take a look at the scale of the print. I am going to assume that the piecing I want to do with this print finishes out at 2-inches square. Using the ruler at the bottom of the image as a guide, I created 3 different 2-inch square boxes in different areas of the print. Copying those squares out to be beside each other and then looking at the same squares in greyscale, you can see that there is a definite color value gradient within the print that would make this particular fabric a poor choice for color value consistency. 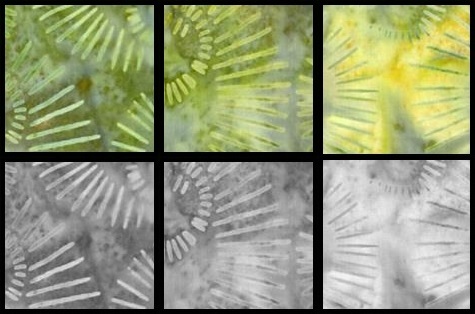 Going back to the original grouping of fabrics in greyscale, the middle print does not read as one color value, nor does the print to the right of the middle. If I am looking for a fabric that reads as a solid color, the best choice out of the five selected fabrics would be the fabric second from the left; the rest of them might not be well suited for a color value project. It is sometimes easier to notice these subtle nuances when viewing fabrics together in person, but paying attention to print scale by looking for images of the fabric with yardage indication has been very helpful for me when shopping online. Also, just because I used batiks in this example does not mean that batiks are the only fabrics that have these characteristics! 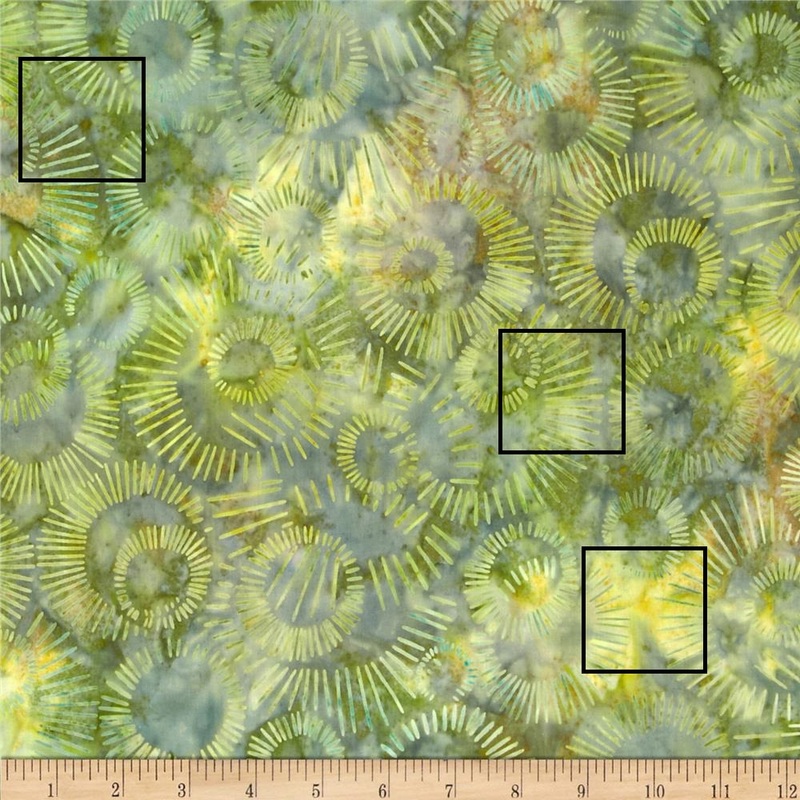 Finding prints that read as a uniform color and color value can be tricky, especially large scale print repeats when small piecing will be used from yardage. Using this technique has been really beneficial for me in my fabric selection process. Linking up to Tips and Tutorials Tuesdays (button to the right). I would echo the need for knowing the scale of prints. I once ordered a floral and was appalled when it arrived–the flower being about 6 inches across. Not what I had had in mind at all. Excellent points about both print scale and relative value, thank you!. To help see value differences when you can’t use a greyscale photo, such as when in an actual quilt shop, it helps to place the fabrics side by side and squint at them. This reduces your perception of brightness and allows you to see value differences more clearly (professional colorist’s trick from my working days). Thanks for the information. Love your Triangle Transparency. Wow! You are so clever. I don’t buy much online, but can see how helpful this would be. Great post Yvonne! I purchase fabric mostly online and sometimes the photos can sure fool you. Print scale is one area where I sometimes end up quite surprised. Sites that have the size of the swatch like Fabric.com does are so helpful. Batiks can be very tricky when it comes to ranking them in value. But then too, you can get more than one value out of each batik if you fussy cut it. Your grayscale trick is very useful, especially for testing value out before making purchases! I do something like that, only i put the fabrics up together on my design wall and view them in low light. Twilight and dusk are the best times for noticing how the values of fabric compare. Great way to check value of the fabrics online. But when checking them in person, a cell phone picture converted to black and white is very useful! thank you for this article, it is very helpful when selecting fabric on line where you can’t actually compare side by side and in person. Very interesting, I definitely need to be more careful of the variations across the fabric. It’s always sursprising how different fabrics look in B&W and what i think is a smooth transition suddenly has a jump! This is an awesome tip for those of use (me included) that do a lot of fabric buying online. This might have prevented my latest fabric ordering oops and saved me some money. Thanks so much for this post, Yvonne. You really made it so clear! Can we ask for more posts on how to do color transparency?? Thank you for sharing this info, I’ve always struggled with this and seeing the examples really explained the process for choosing fabrics. Great post. I’m never good at putting colors together and while I take photos and then covert them to black and white, I still don’t always know what to change, and why something doesn’t work even though I think it’s the right value. I need to play around more with this. Thanks! I personally think I am horrible at choosing color in a gradient sequence… when I want to do this, I typically buy fat quarter sets of colors. LoL I also wish I had the time to do all of the things I want… or that I could sleep for 3 hours per day and be good to go! Crazy I didn’t notice the things you pointed out until you pointed them out… details details details. Thank you….the grey scale makes an incredible difference…..I must try it out as I select my fabrics for the transparency quilt. I often shop fabric online. Can you explain how you created the grayscale photo from the fabric.com site? I love their design wall and would like to be able to evaluate purchases better. I downloaded the images off the site and once the images are on your computer you can manipulate them just like any other JPG photograph. To download an image off of a webpage, right click on the image and then select Save image as… to save it to your hard drive. This was very enlightening. I appreciate your explanation of why the dark on the right probably wouldn’t work for your project. I thought the middle print and the one next to it on the right were very close. But it wasn’t until I finished reading your explanation that I realized you were looking at them to see if they were uniform in color across the swatch.